I first learned of Miss Eliza Leslie when I was in graduate school, doing some research on American 19th century etiquette guides. Miss Leslie had written a popular one, full of advice on matters such as dining at table, writing letters, paying visits, and navigating crowded sidewalks. In one section about proper behavior at a party, Miss Leslie went on at great length about the fact that if you are meeting a cookbook author, you should refrain from saying things like “I tried that recipe and it did not work” unless you really did follow the instructions scrupulously. When I read this, I laughed, but after a morning spent wrestling with a Miss Leslie cookbook I am beginning to understand why she found herself in these conversations. This is the moment you’ve all been waiting for, isn’t it? My first major failure. I searched through Miss Leslie’s Secrets, a facsimile reprint of the 1854 New Receipts for Cooking by Miss Leslie, trying to find something I would be able to make in a 2009 kitchen, and I failed. To be sure, Miss Leslie didn’t give me a lot to work with. Many of the recipes proved unsuitable because I was unable or unwilling to find the right ingredients; I was stopped cold by lines such as “Having roasted some reed-birds, larks, plovers or any other small birds, such as are usually eaten…” and “Have ready an ounce of the best Russia isinglass boiled to a thick jelly in half a pint of water.” (I will not relate the instructions for killing a turtle.) I had also decided I needed to make food, not home cleaning supplies or physick, so I could not avail myself of offerings such as “cure for prickly heat” (bathing with wheat bran), red lip salve (involving suet, lard and alkanet), or gum-arabic paste. Techniques were another challenge. I knew that if I baked, determining oven temperature would be tricky since Miss Leslie is rather vague on this head; I knew that vegetables were an unlikely choice because of my principled refusal to boil the life out of them. I knew that measurements would vary among weights, size estimates (“take of the prepared rice a portion about the size of an egg”) and odd volumes (“a wine-glass of strong, fresh yeast”). I knew that all these things might work against me, and yet I pressed on. Cut up the butter in the milk, and if in cold weather, set it in a warm place, on the stove, or on the hearth near the fire, till the butter is quite soft; but do not allow it to melt or oil; it must be merely warmed so as to soften. 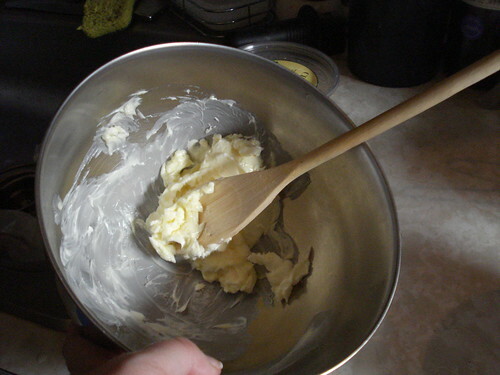 Then take it off, and with a knife stir the butter well through the milk till thoroughly mixed. Is this something you have ever tried to do? Let me tell you now, it’s not easy. 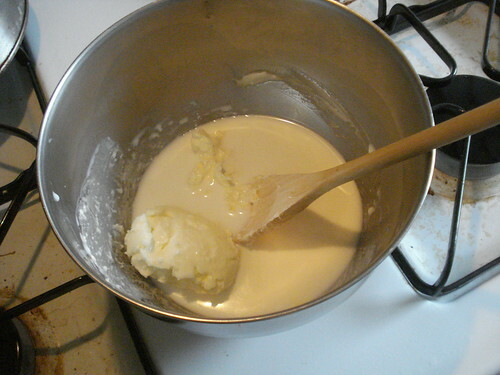 Even when warmed, soft butter does not want to blend evenly with liquid milk. Soft butter wants to lump back together in a soft buttery mass. I don’t know if the butter would have blended in more readily if the milk had not been homogenized, but it sure didn’t want to blend here. Mixing with a knife in a cutting motion (trying to break up the butter) got me nowhere; trying to use a spoon was no help. Finally I tried to beat with the knife as if it were a beater blade, and this seemed at least to distribute little bits of butter more evenly through the milk. 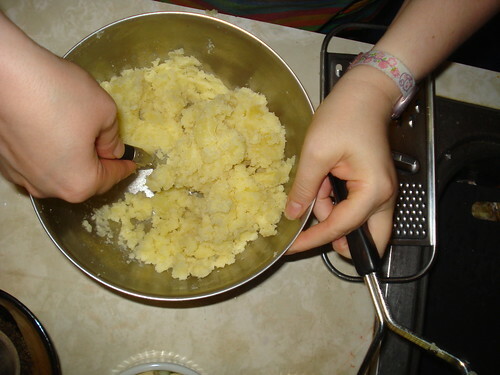 I would not call this thoroughly mixed, but at least we were somewhat advanced from the stage of large isolated lumps of butter in broad expanses of milk by the time my arm felt like it was going to fall off from all the beating. Then there was the flour. I don’t have a kitchen scale and so had to estimate using our regular scale (step on with the bowl of flour, step on without it, calculate the difference, add or remove flour as appropriate). I probably didn’t have enough flour. Certainly the batter was thin, but I wasn’t sure if that was because of the flour or because of the failure of the butter to mix well with the milk. Miss Leslie doesn’t mention what the batter should look like. 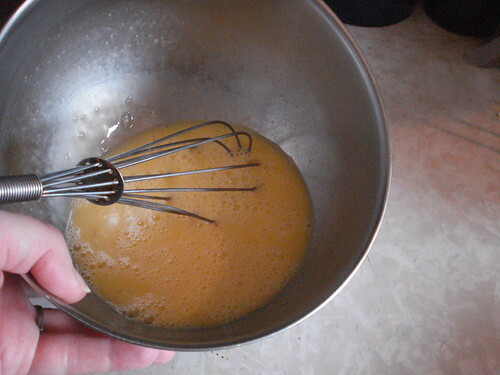 The eggs were relatively easy: beat “with a whisk until they are very thick and light.” It’s possible I could have beaten the eggs longer — did I mention my arm was tired? — but I did get them thick and light. 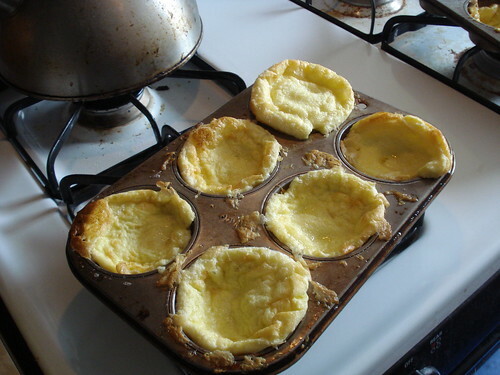 At this point I was to add the flour alternately with the eggs to the milk and butter mixture, then “stir the whole very hard” and put it into buttered muffin tins. 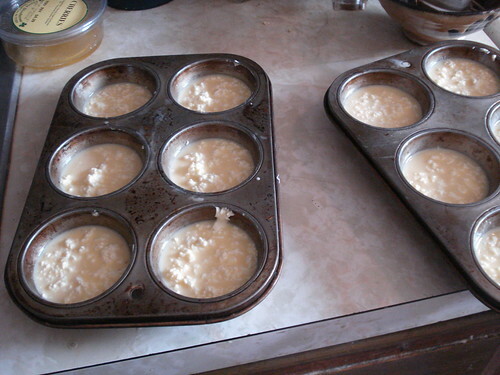 OK, Miss Leslie said buttered tea-cups, but I have muffin tins and I know they’re oven-safe. I was not too sanguine about the mixture, but put it in the oven. Miss Leslie instructs you to bake the puffs in a “brisk oven,” which I decided was probably somewhere around 375 degrees. 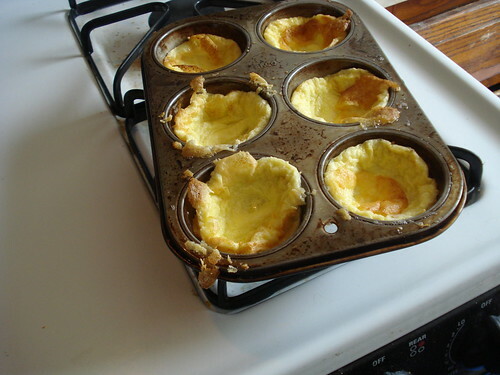 “Bake them twenty minutes or more, till they are well browned, and puffed up very light,” she says. I began to recover some of my optimism as they baked; when I turned on the oven light about eight minutes along the batter was definitely rising, and by twelve minutes they were really puffing up. I might have puffs after all, I thought. 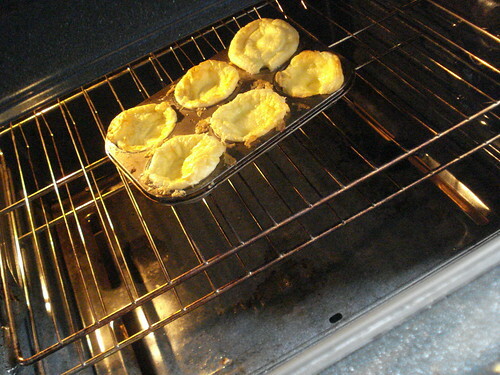 And I did — until I took the puffs from the oven and they fell flat before I could even set the pans down. Miss Leslie instructs you to cut a slit in the side of the hot puff and fill it with jelly, but there was no longer any space to fill. 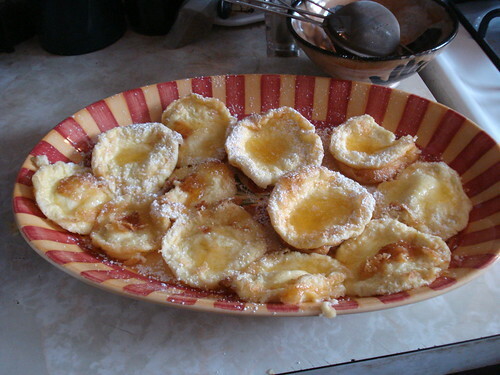 So I dabbed peach jam on the tops of the no-longer-puffs instead, then sprinkled them with powdered sugar as instructed. I served them freshly made, though Miss Leslie recommends they be eaten cold. “If properly made they will be found delicious,” she concludes. ([Expletive deleted] you too, Miss Leslie!) 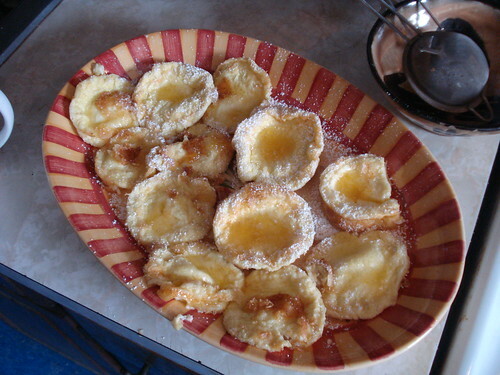 I can tell you that although not properly made they still tasted all right — rather eggy, but not bad, and well matched with jam and the sugar. I think it’s possible that if I had added more flour I would have gotten a more robust puff that would not have fallen. 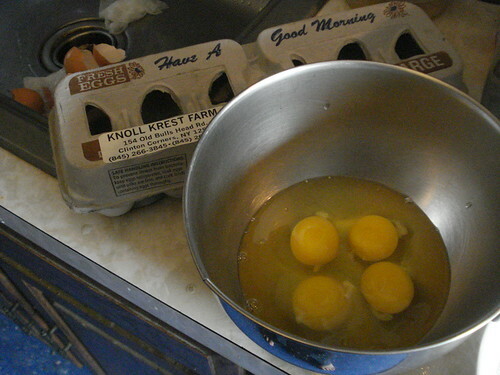 I think it highly probable that if I had used an electric mixer I would have gotten well-mixed milk and butter. (Imagine if Miss Leslie had had a KitchenAid! There would have been no stopping her.) I am highly unlikely to try these again, but if I did want to give this another shot I’d get a scale so I could be more confident of the right amount of flour; I’d use a mixer to cream the butter and then gradually add the milk while beating so that it would be slowly worked in; and I’d dig through some of my other comprehensive cookbooks to see if I should change the temperature up or down from 375. Verdict: Failure. It had to happen some time, I suppose. My husband just walked past and saw me at work. “Miss Leslie Regrets,” he said. “That’s what you’re having right now.” Too true. Pasta Recipes & Techniques is a gorgeously illustrated cookbook from the Cooking Club of America, which is a membership organization that seems to be a very efficient way to sell you things. As with so many items in my collection, I got this through a book-of-the-month style setup where I was sent the book and had a certain period of time to return it. I did manage to send some back before quitting this particular group, but I kept Pasta because everything in it looked great and I really wanted to use it some day. 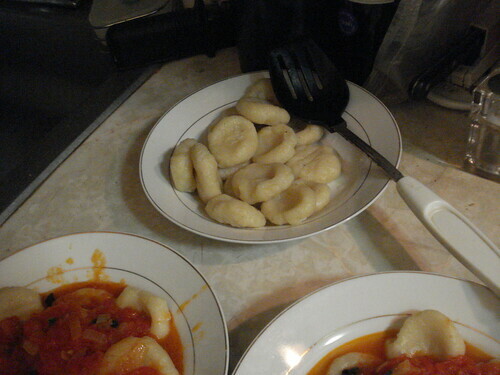 That day came yesterday, when I set about making gnocchi. 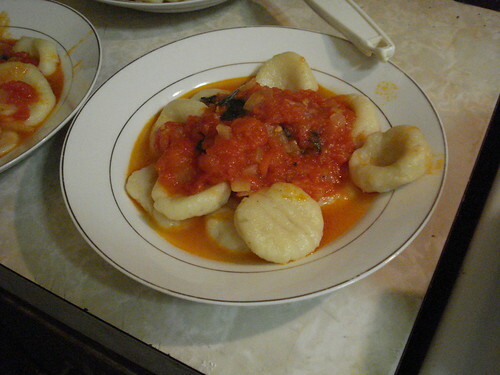 Gnocchi are not exactly pasta, but are a dumpling that functions very like pasta in a sauce or soup. They don’t include egg, and you don’t roll them in the same way you do pasta. I decided to make gnocchi for two reasons: I had eaten them before in Cleveland’s Little Italy and thought they were grand, and I don’t own a pasta roller and wanted to get one before trying the pasta in this book. At this point one can set the gnocchi aside in the fridge for up to three hours, but I let them rest briefly at room temperature while I got the sauce simmering. 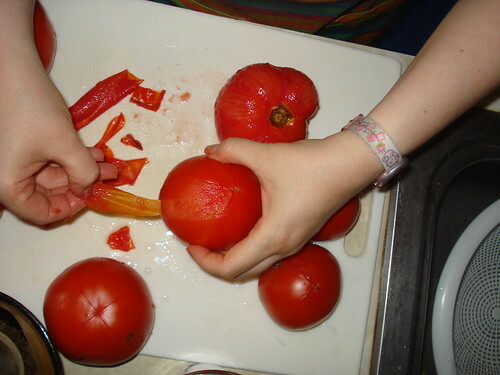 The recipe for gnocchi says they go well with just about any sauce, so I decided to take advantage of the fresh tomatoes at the Greenmarket and make a simple tomato sauce. 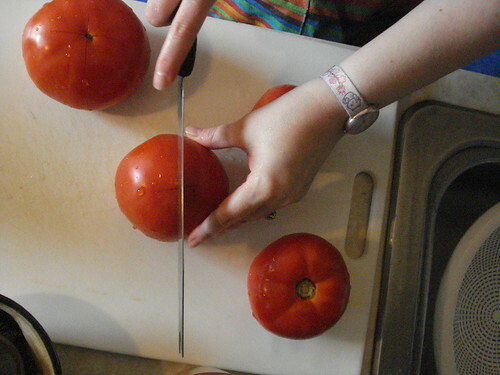 While the potatoes were baking, I peeled, seeded and diced some tomatoes; as with the peaches, the easy way to peel a tomato is to score an x on the bottom, dunk the tomato briefly in boiling water, and then peel the now-loosened skin away. 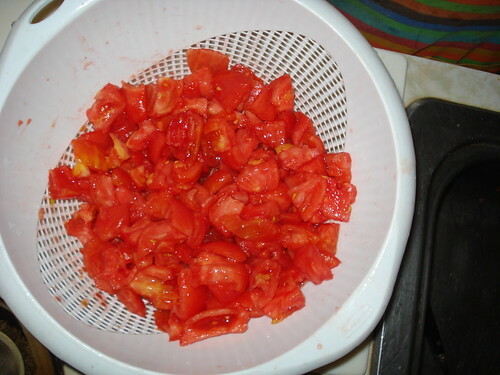 I let the tomato chunks sit in a strainer for a while so that any excess water could drain off, and in the meantime I diced a small onion and bruised some cloves of garlic by pressing them hard with the flat of a chef’s knife. 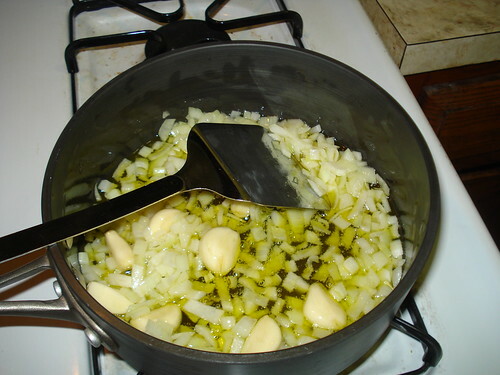 When I was ready to start the sauce I poured some olive oil into a pan (more than I think was necessary — so many of the recipes I have been trying are wild with the oil) and sauteed the onion and garlic until the onions were soft and the garlic a bit darkened. 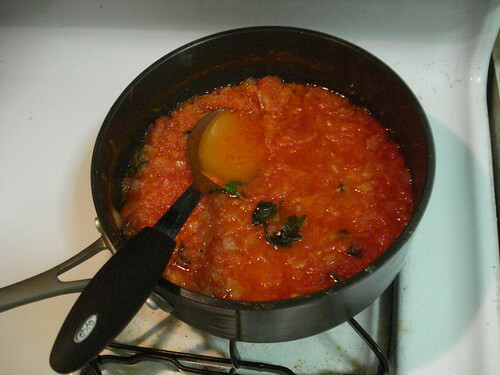 Then I discarded the garlic and added the tomatoes and some salt, brought it all to a simmer, and let it cook and thicken a while. 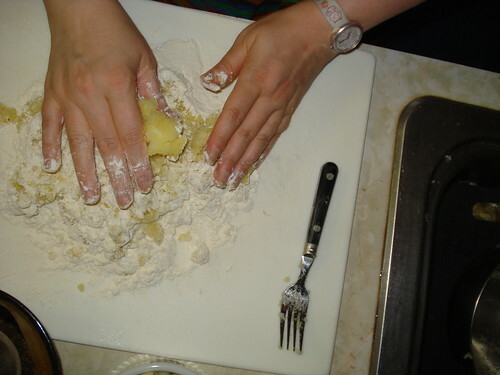 The recipe recommends 20 minutes; I let it go 30 as I got the gnocchi ready, and I think one could go a bit longer. When I decided it was done, I took it off the heat, added a bit of freshly ground pepper, and stirred in some coarsely shredded fresh basil. Once I had the sauce under way I put a big pot of water to boil for the gnocchi. When it was nearly boiling I added salt, and when it was fully boiling I dropped in about a third of the gnocchi dumplings. They sank to the bottom and burbled along for several minutes; then they started popping up to the top, which was the sign that they were done. (I don’t have pictures of this part either, which is a shame — it’s really cool to watch.) 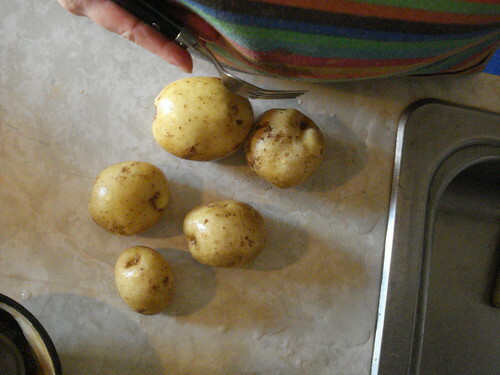 I scooped them out with a slotted spoon as they surfaced, and dropped them into a colander for several minutes before putting them in serving dishes. I cooked the gnocchi in three batches; I could possibly have done more in each batch but you don’t want to crowd the dumplings.¬† Once they were done, I put some into bowls and added sauce. e, mangia. 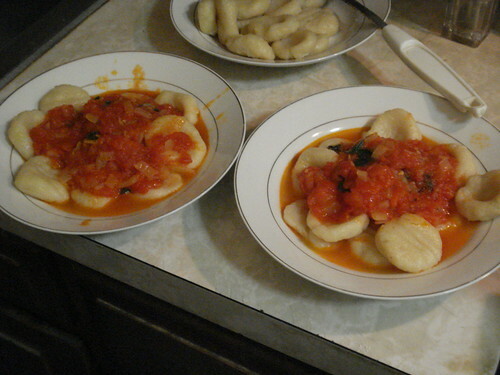 The gnocchi were delicious: they had a smooth texture and a rich, subtle flavor, and the went very well with the sauce. 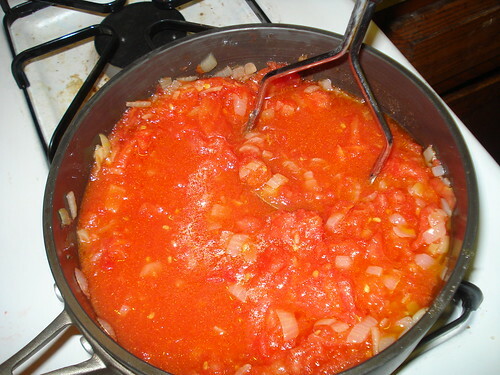 The sauce was also delicious, bright and tomatoey and savory. Verdict: Success. I will definitely be making these again, and soon; the cookbook advises that one can make them ahead, cook them and freeze them, so that on a busy weeknight they can go straight from the freezer into boiling water. And the sauce will be a starring player on pizza tonight.